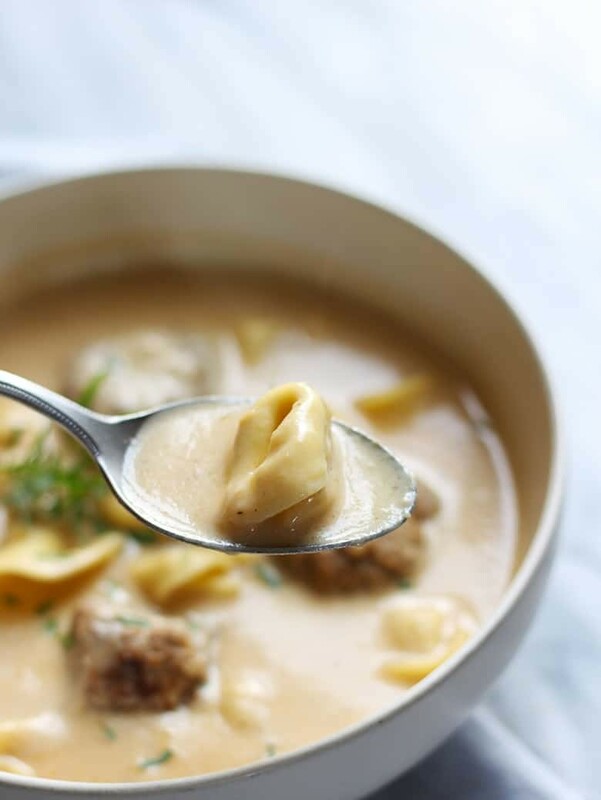 Warm up to this skinny version of creamy Tortellini Alfredo Soup and skip the guilt. A roux adds to the creaminess and turkey meatballs round out this Italian-inspired dish. 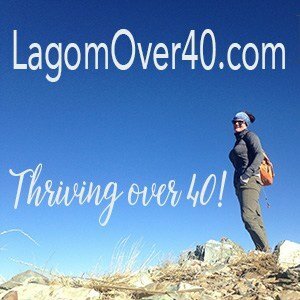 Our home has busy times and slower times. It’s during the busy times that I really need an easy dinner solution. Aside from take-out or straight-out-of-the-box frozen entrees, I take other convenient shortcuts for dinner. 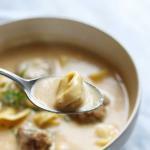 One of David’s favorite shortcuts is ‘fresh’ cheese tortellini from the refrigerated section of the supermarket. Mine are frozen meatballs. 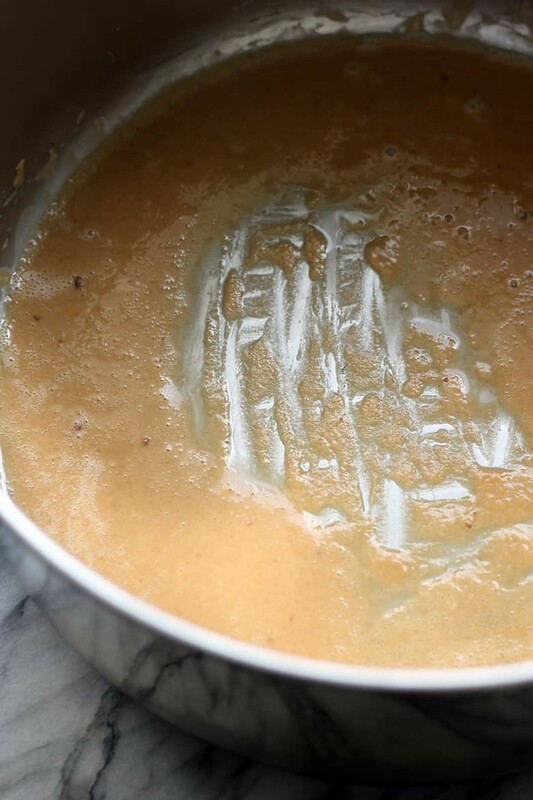 This dish has both, added to a creamy sauce started from a roux. The base of this dish is a basic alfredo sauce, a béchamel sauce made from a roux with added parmesan and 2%milk, instead of cream. I added veggie broth to make this alfredo sauce into a soup. Instead of the usual fettuccini I used my hubby’s favorite pasta, cheese tortellini, and added frozen turkey meatballs. This soup came together easily and was quite filling. I like to think of my soups as it pertains to seasons and I would call this a Winter soup. The flavor profile on this is sophisticated enough for Mom & Dad but friendly enough for the little ones too. This is a family recipe indeed. 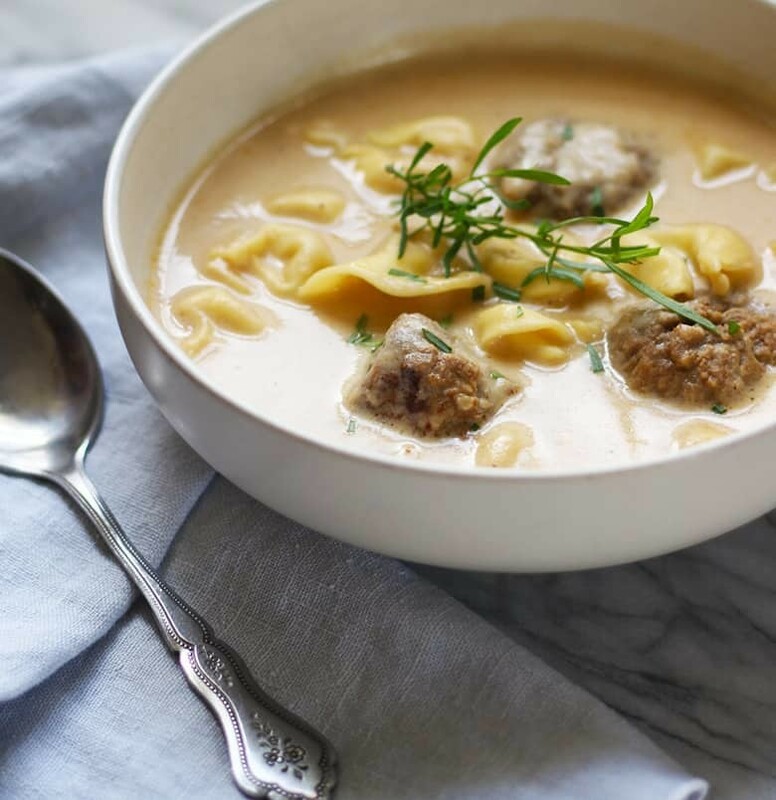 This Tortellini Alfredo is not vegetarian but can be easily remedied with the addition of vegetarian ‘meat’ balls or skipping the meat balls altogether. Simply serve this dish with a small salad and you have a complete meal. Alfredo soup can be reheated but I wouldn’t freeze it. 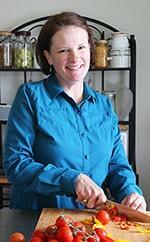 Anything with dairy fat usually separates if frozen. It may not come back together when you re-heat it. Also, if you are going to have leftovers, keep the tortellini pasta separate in the fridge and simply reheat together. 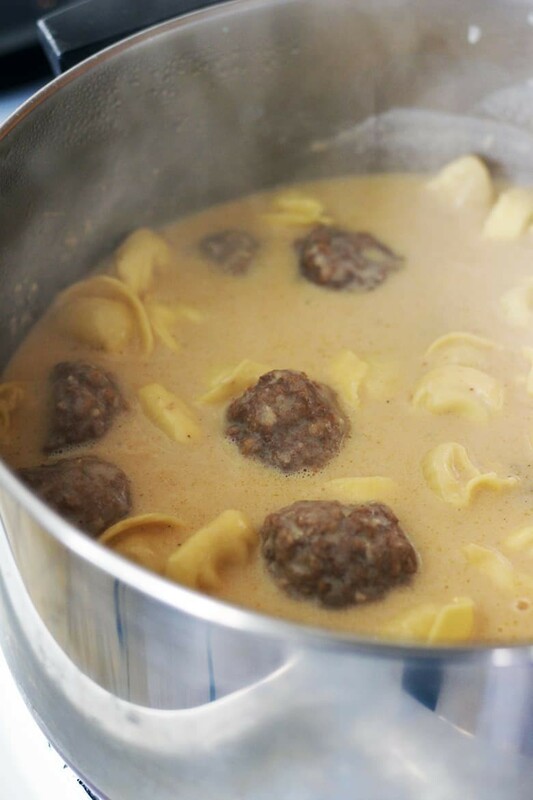 If you keep the pasta in the soup overnight in the fridge, the pasta will continue to absorb the liquid. 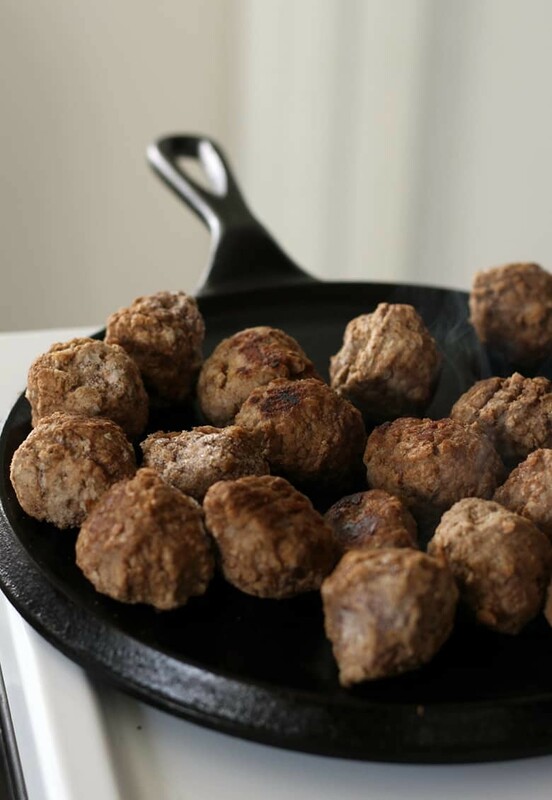 In large skillet over medium heat, cook frozen meatballs until browned on all sides. Over medium heat, add oil to a dutch oven or large sauce pan, stir in flour. Stir continuously until flour turns golden and smells nutty. Stir in broth, milk, pepper and bring to simmer. Add meatballs to dutch oven and bring back up to a simmer and cook for 5 minutes. Add pasta and simmer 5-7 minutes or according to package directions. Check for doneness and garnish with fresh parmesan. If you are going to have leftovers, keep the pasta separate from the soup otherwise the pasta will continue to absorb the liquid. One way to do this is to boil the pasta separately and add to soup bowls when ready to serve, pour over the soup. Refrigerate the rest separately. Another way is to make the soup as directed but only add enough pasta that is needed. 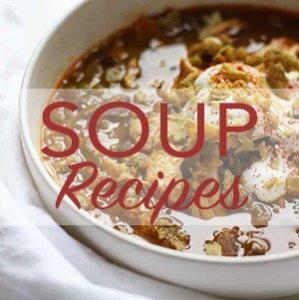 I really like the lighter version of a comfy soup. It’s so cold here and I love to sip soups. It really warms me up. I like alfredo sauce so this seems like the perfect way to enjoy it with out all of that cream. Saving this for later.